I’ve been back in America for exactly a month now. However, during the time in July prior to my goodbye in South Africa and until now, I was never inspired to write a blog post about it. I had reached a point in my service that I was very, very ready. Ready to go, ready to say goodbye, and ready to jump into the next thing. Simply put, I was ready to jump into my next move because I felt I had done as much as I could at site. I was in a complacent place with my work and knowing that I made a difference. I did what I could do without burning out to an extreme. I was ready to say goodbye because I couldn’t stay there forever. As much as I loved my host family, I’m not part of their culture and must return to mine at some point. I was ready to go because I was incredibly sick of being harassed (to a point where some new drunk idiots moved in by my taxi stop and would cat call me in my own village). I had a lot of anger built up inside of me toward the country, specifically because the way men act and how women are treated. Two years was, good god, enough. I find it rather sad that I left with some of these feelings, because I had an incredible experience and don’t regret it one bit. But, sometimes you’re just ready. My patience grew weaker as time went on, likely because I knew America was around the corner. The next jump for me will be graduate school at NYU to obtain my MPA. In the future, I hope to start my own nonprofit or be the director of communications of a nonprofit that focuses on public education in the US. (City Year!) I’ve got plenty of years to figure that out, but I’ll still be in the public service sector. I hope to have interesting things to continue to write about — but for now, I’m just a lost puppy wandering around NYC and getting “acquainted”. Thank you to everyone who followed my post-undergraduate service journey in one way or another! For any City Year or Peace Corps hopefuls, please use my archives as a resource. Always feel free to contact me with any questions about either programs (contact tab above). I encourage you all to serve our country or another, and I’ll keep doing the same! Now that these two years are coming to an end, I’ve recently had an unexpected revelation: Explaining one’s Peace Corps service to someone outside of Peace Corps – in a few words – might as well be more challenging than the Peace Corps itself. There are so many different aspects of our two years that make up our Peace Corps service as a whole, but takes practice to summarize into a one liner. As I flail and try to enter the real world back in America, I’ve done a lot of introspective thinking about what exactly my job has been here. What’s my one liner? The implementation gap. That’s it. This term derives from City Year (of course), but I really relate it to my Peace Corps service as well. Addressing the implementation gap refers to giving needy schools extra support – these schools are not designed or equipped for the demands that face them often in high poverty areas. Inferred from my two years in South Africa, I believe that the school system is not designed properly for rural educators and students. There are a few ways that can alleviate this, and most importantly from the Peace Corps side: extra support. Although rural schools are small, the challenges educators face are far more time consuming than they would in a more developed area 40 kms down the road. This particularly has to do with the demanding curriculum that switches to all English in grade four, which the kids struggle to complete. Completing the curriculum on-time rarely happens, and there is little – if any – time to stay on one topic the learners are struggling with. My colleagues make kids come to school during holidays or weekends to catch up on the curriculum or go over things they don’t understand. My educators also act as parental figures for a lot of these kids who are orphans or are being raised by gogo (grandma). They know the background story of the kids and make sure they are being cared for. I have seen the result of their care – in particular, one grade 8 girl who has a challenging home life, but was also raised at school. She is top of her class and the most respectful and caring young girl I have met here. There are 15 educators on my staff that teach full-time. Their periods off are spent grading papers. Outside of that, they have little time to attend to individual students or any project that does not relate to their primary teaching job. Stay after school you think? That generally isn’t possible either. Some learners walk up to an hour to get to school, and educators travel up to an hour. All of my colleagues work really hard, and care about their jobs and these kids, but there’s only so much they can do. That’s where the Peace Corps comes in! 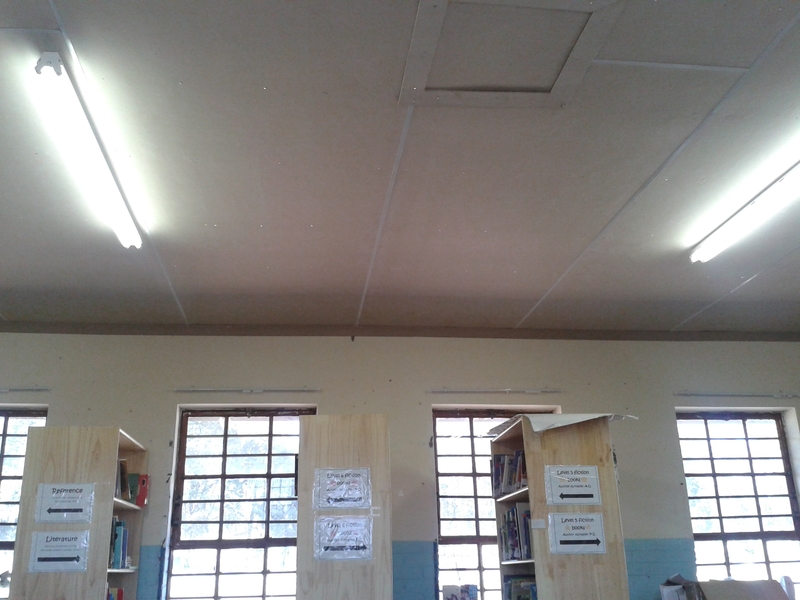 As you know, the Masotsheni Primary School library has been a trial and error process for about two years. I came here, saw there was ample space for a library, but realized that my staff just didn’t know how to approach getting a large donation of books. Simply, that I am computer literate, have an understanding of how to work with nonprofits and administratively organize such projects through email/Internet/technology, and have all the time in the world to focus on a large project was that extra support this little rural school needed. My principal told an adorable story at our library opening ceremony about her first attempt at a library. When she first was accepted to become a David Rattray Foundation school, Ben came to check out our school and see the library. He told her the library was not a library, but a storeroom, and he would not give the school books until the room looked better. My ma’am then set out to organize the books as a library in the best way she could over the weekends. Unfortunately, she never had enough time to set up a system other than putting books on the fiction and non-fiction shelves. I’m not quite sure what happened after that, except I arrived to site a few months later and saw a perfect opportunity for a project. 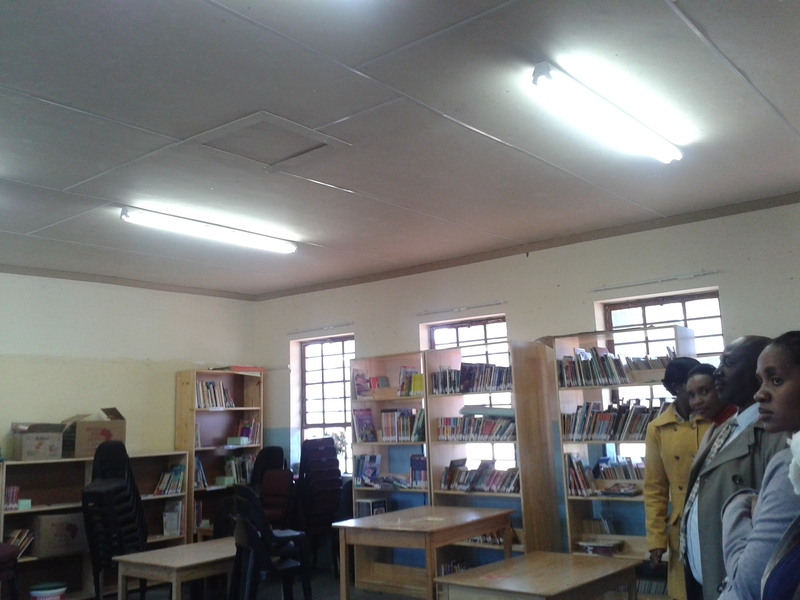 Since the library has been done, my staff and learners have done everything they could to fulfil their part of the bargain. The library is functioning, being treated with respect, and the kids are eager to use it (and sit on the new carpet!) My principal oversees the library as much as she can, brings classes in, checks up on the classes when I’m with them to hammer down the law, and does orientation for them in Zulu and English just in case they don’t follow me. I have two grade 7 library leaders, Nokulunga and Snenjabulo, who look over the checkout book every day and ensure the books are returned, reshelve them, and help younger learners checkout and find books. They do this ALL without me EVER telling them to do it – I simply gave them an orientation of how to do things; they are both incredible learners and I’m really enjoying closing my service with the pleasure of watching these kids take such pride in their school. My Peace Corps service ended up being how I had pictured it – aiding people to accomplish a goal they already wanted and were trying to reach before I arrived. I alone cannot change the world, but I can help others who want change. I was just one helping hand that brought the missing pieces to the puzzle. Our school now has one more resource for continued extra support in English that over the years will hopefully help alleviate the language and literacy barriers rural children face. Now that the time consuming part of the project is over, from here on out it’s up to my school to keep it going. I’m confident that I’m leaving South Africa knowing that this library will be ran correctly for years to come, because everyone involved wanted this project to happen just as much as I did. And there’s that. What did I do in the Peace Corps? I helped close the implementation gap. See you July 19th, America! I have been approved to close my service and leave South Africa on July 19th — 30 days before graduate school orientation. The process of leaving makes me extremely sad, and already teary-eyed, but I can’t stay here forever. My projects are done, and it’s about time to go home — it’s just bittersweet. I will leave knowing a new Volunteer will be with my family and school next September, which I’m thrilled about. But, I don’t want to talk too much about the sad stuff yet, so I can talk about the things I am looking forward to! I’ll be coming to my dad’s house in Houston, then flying to San Francisco to visit my hometown and best friends, and then to New York to search for an apartment. (I’m really trying to make it out to Los Angeles as well, but had to reassess my plans because I’ll really be scraping funds on this whole moving to one of America’s most expensive cities after I’ve been living on a stipend for three years thing.) I’ll be living with my friend Rakeesha – a fellow Returned Peace Corps Volunteer from my cohort – who is also attending NYU, but for her master’s in journalism! Although life for me here is normal now, adventure awaits! I’ll be leaving here with nothing but happy memories as those trump any bad ones, and that’s exactly how I had hoped I’d leave. I’ve been MIA on my blog lately because I’ve been busy finishing projects and spending time with people before this journey is up. Anyways, here’s a late — but better than never — video of Sebetsang reciting one of his poems at a library opening ceremony at my school. I wrote the quote, “Education is the most powerful weapon you can use to change the world” (Nelson Mandela) for him once, and from there his ideas have spiraled into an essay and a poem. Take a look and see just how bright this grade 8 boy is! I’ve recently learned his name means “hard worker” in Sotho. He’s come a long way, and I can’t fathom how well he’ll be doing in five years. Thank you for your generous donation and helping leave a Warden legacy here in South Africa, Grandpa Warden! The kids of my village will benefit for years to come and treat their library as a home away from home. I’ve been working nonstop in the library until 5pm everyday in order to prepare for our official opening ceremony this Thursday with representatives from the Dept. Of Education, Peace Corps and David Rattray Foundation to thank the Sir Emeka Offor Foundation for donating a second container of Books for Africa books to South African schools, and Books for Africa for working with Peace Corps South Africa for the past two years to make these libraries a reality. Almost. Done. But, as always, more to come. Two more days! Family. Umdeni. Depending on one’s culture and values, that word can have a lot of different meanings. For Zulus, family spans from the immediate family to the most distant relatives. (For example, when I ask my sister how someone is related to our family, she sometimes shrugs and laughs with an, “I don’t know.”) For me, family has been strictly immediate – ya know, the people who helped raise you or that you have made memories with. I was literally dropped off at my family’s home way back when. They didn’t know anything about me except my age, gender and country of origin. Since then, I’ve become a real part of this family, and my definition of family has changed. Yesterday was Easter Sunday, and we ventured up the hill to gogo’s house. All of my mom’s siblings were visiting (my aunts and uncles) and all their children (my cousins). Specifically, one cousin was visiting who went to the primary school I work at, but since then moved to another area with her uncle for secondary school. I’ve been here long enough to see her transition from a little girl to a full blown teenager, which alone makes me feel like I’m a member of this family. Even more so, my mom likes to call me and my sister “black and white twins” — makes me laugh every time. My sister and I are both 25-year-old (soon to be on my part) only children. The immediate family on my property is pretty small, so they wanted to expand their family, just like I did! When I say “mom”, I’m 99 percent sure talking about my South African mom. Same goes for grandma, uncle, aunt, sister, brother, cousin. That’s not to say I’ve forgotten about my American family, but I don’t differentiate the two. Everyone here and everyone there is a part of my family. Last month, my American dad and step mom had the pleasure of visiting my family and village. We had dinner and cake for my sister’s birthday, and watched the video from my mom’s wedding. Both of my families got to meet, spend time together through a bond I share with both of them. Ironically, visiting gogo’s house on Easter reminded me so much of visiting my own grandma’s house when I was younger. I can’t understand most things people say at family gatherings unless my sister translates, so I kind of just sit there, twiddle my thumbs and laugh when people are acting things out because then I get some sense of “what’s going on”. As a kid, I did relatively the same thing at my grandma’s house, but because I was the only kid and no one was close to my age. This Easter, I couldn’t help but laugh to myself because as different as they are, my family experiences still share some similarities. Just one more reason why I merge the two! My family is hosting the next Volunteer that will replace me in September. It’s bittersweet to know I will be replaced because another American will be welcomed into this family; he or she will get to have the amazing experience I had. I just hope they always remember me, because I will never forget them! 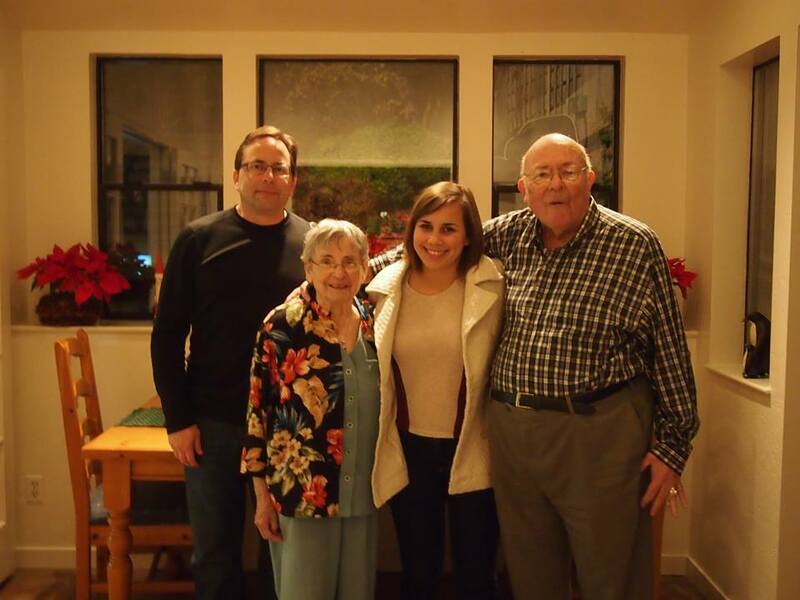 I will always consider them part of my family, and am happy my dad and step mom were able to meet them. Much love to the Mathebulas! I cannot begin to thank them for all they have done for me, especially giving me an incredible family from one continent to another. I now understand that family doesn’t have to be the people who have always been in your life; family is the people who treat you like family – that’s what will always count.